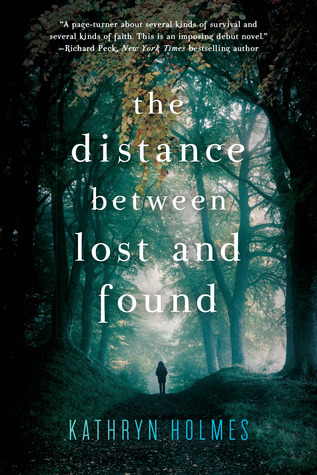 As a member of the Fearless Fiteeners, I was able to read an ARC of Kathryn Holmes’s young adult novel, The Distance Between Lost and Found (2/17/2015; HarperTeen). ARCs (Advanced Reader Copies) are the uncorrected proofs that are sent to reviewers, librarians, and book bloggers to promote the book. My fellow fifteeners and 2k15 classmates are sending their ARCs on tour, which allows us a sneak peek at these upcoming new releases. I’ve decided to let you all know about the ARCs I’m reading to help support my 2015 debut colleagues. These are introductions, not reviews, just to let you know what’s coming out in the next year. Here’s the description: Ever since the night of the incident with Luke Willis, the preacher’s son, sophomore Hallelujah Calhoun has been silent. When the rumors swirled around school, she was silent. When her parents grounded her, she was silent. When her friends abandoned her…silent. What I liked about it: Kathryn Holmes does a great job of blending the adventure/survival story with contemporary YA issues. First, on the survival front: Holmes does not go easy on her characters. Hallie, Rachel, and Jonah purposely leave their group and figure it would be easy enough to find their way back. Right. The physical challenges they face include a limited amount of food and clean water, poison ivy, and a severely sprained ankle–for starters. Things get worse. Much worse. The increasing tension related to their survival make you care about the characters and their fate, as they in a life or death situation. Next, on the social/emotional front: Being stranded in the Smoky Mountains would have been enough as far as conflicts go, but Holmes adds another layer. These teens are on a religious retreat rife with gossip and back-stabbing, stemming from an incident that happened much earlier. Hallie’s pain is real and raw. She has to dig deep into her physical and emotional reserves not only to survive this situation but also to get through it with renewed faith in herself, God, and those around her. About the author: Kathryn Holmes says on her website that for as long as she can remember, she’s wanted to write and dance. Now, she’s lucky enough to divide most of my days between words and movement, as an author/freelance writer and a contemporary dancer. She’s a Tennessean-turned-diehard Brooklynite, an aspiring yogini, a cat person, and—of course—a voracious reader.